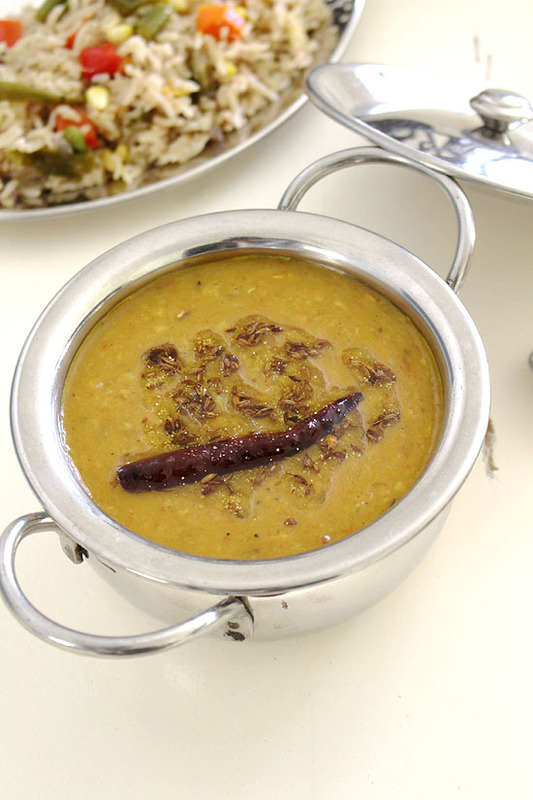 Dal tadka recipe – This recipe gives the exact same result as a restaurant does. This is the BEST recipe, give it a try. A mixture of arhar dal, moong dal and masoor dal is pressure cooked with onion, tomato and spices. Then dhungar method is used to give the smokey flavor. 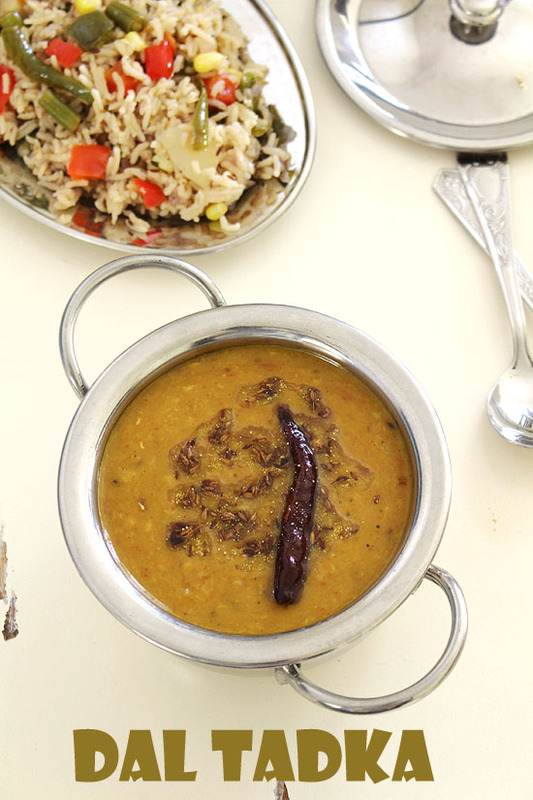 At the end, cumin garlic flavored tadka/tempering/chaunk is poured into the dal to perk up its flavor. 1) Take toor dal, moong dal and masoor dal. 2) Wash them under running cold water till water runs clear or rinse them with cold water for 3-4 times. Keep it aside. 3) Heat the 1 tablespoon of oil in a pressure cooker. Once hot add onion and sprinkle little salt. 4) Mix and saute for 2-3 minutes or till the onions become translucent or light pink in color. 5) Now add ginger paste, garlic paste and green chili. 6) Mix and cook for a minute or till the raw smell of ginger garlic goes away. 7) Add tomatoes and mix. 8) Cook till tomatoes are soft and almost mushy. 9) Add remaining salt, turmeric powder, red chili powder and garam masala. 11) Now add washed dal. 12) add 1 ½ cups of water, stir. 13) Cover the cooker with lid, put the weight on and cook for 5-6 whistles on medium heat. Let the pressure go down by itself and then open the lid. 14) Using spatula slightly mash and stir the dal. Add another ½ cup of water. You may or may not need this extra water. Adjust the water quantity as per the dal consistency. And let it simmer for 3-4 minutes. 15) Now for dhungar or smoking method. Heat the charcoal on the direct flame. Use the rack and tongs. 16) Keep turning and heating till it gets smokey, hot and red. Place that hot charcoal in the small steel katori or bowl. 17) Place that katori in the center on the dal. 18) Add ¼ teaspoon of garlic paste on hot charcoal. 19) And drizzle ¼ teaspoon of ghee. As soon as ghee heats, the smoke will come out. 20) Immediately cover with the lid to trap all the smoke. Keep it covered for 2-3 minutes and let the flavor get infused. You can increase the smoking time as per your liking. But start with 2 minutes and taste. Increase the smoking time if required more smokiness. Once done, remove the katori with the help of tongs. 21) Let’s prepare the tadka. Heat the ghee in a small pan on medium heat. Once hot add cumin seeds and let them sizzle. 22) Then add smashed garlic cloves and dry red chilies. Saute for a minute. You will notice the chilies will get darker color. 23) Now add hing and turn off the stove. Don’t forget to check out below for tips and variations. Serving suggestions: Serve dal tadka with plain, steamed rice or jeera rice. It can be served with mild flavored pulao like veg pulao, matar pulao. This can be served with roti, paratha. For smoking the dal aka dhungar method, I HIGHLY suggest to use natural lump charcoal. Never ever dare to use instant light charcoal briquets. Those have chemicals in them and we don’t want that smell of chemical in the dal. I am saying this from my experience, trust me. With this smoking method, you can play with different flavors. I wanted the garlic flavor in my dal tadka, so I used garlic paste over the hot charcoal. You can try with only ghee. Or substitute the garlic with cloves or garam masala powder. If you don’t like the smoky flavor in this dal then skip that step entirely. Here I have used mixture of three dals. You can use only one or only two. Anyway it will taste good. In the tempering aka tadka, ghee is highly recommended. This gives rich flavor to the dal. You can use oil too, but flavors will be compromised. If making for guests then you can make the dal ahead of time minus tadka. At the time of serving make the tempering and serve. This way it tastes much better. This dal tadka recipe is made just like the restaurant style. It is delicious, flavorful with smokey flavor (which comes from dhungar method). Best served with rice or jeera rice. Take toor dal, moong dal and masoor dal. Wash them under running cold water till water runs clear or rinse them with cold water for 3-4 times. Keep it aside. Heat the 1 tablespoon of oil in a pressure cooker. Once hot add onion and sprinkle little salt. Mix and saute for 2-3 minutes or till the onions become translucent or light pink in color. Now add ginger paste, garlic paste and green chili. Mix and cook for a minute. Add tomatoes and mix. Cook till tomatoes are soft and almost mushy. Add remaining salt, turmeric powder, red chili powder and garam masala. Mix and cook for a minute. Now add washed dal and add 1 ½ cups of water, stir. Cover the cooker with lid, put the weight on and cook for 5-6 whistles on medium heat. Using spatula slightly mash and stir the dal. Add another ½ cup of water. And let it simmer for 3-4 minutes. Heat the charcoal on the direct flame. Use the rack and tongs. Keep turning and heating till it gets smokey, hot and red. Place that hot charcoal in the small steel katori or bowl. Place that katori in the center on the dal. Add ¼ teaspoon of garlic paste on hot charcoal. And drizzle ¼ teaspoon of ghee. As soon as ghee heats, the smoke will come out. Immediately cover with the lid to trap all the smoke. Keep it covered for 2-3 minutes and let the flavor get infused. Once done, remove the katori with the help of tongs. Then add smashed garlic cloves and dry red chilies. Saute for a minute. Now add hing and turn off the stove. Add this tempering to the dal. Pl refer to sl no 20 of the method. Won’t the tongue burn? I think the intent is to write tongs. This is one of the hazards of aurto spell check. . .
looks very tempting. I made the same way except the charcoal part. will try doing that.